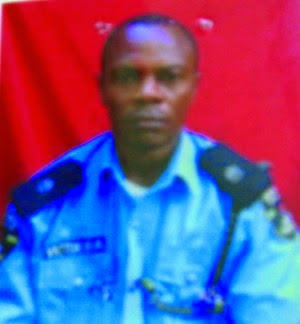 A dismissed Police Sergeant has been arrested by the operatives of the Federal Special Anti-Robbery Squad, Adeniji Adele, Lagos Island, western Nigeria, for allegedly posing as a police officer to defraud the Nigeria Police of about N40 million in eight years.Police authorities alleged that the suspect, Victor Afamefuna Banor, from southern Nigeria, after his dismissal from the Nigeria Police, forged personnel emolument records, including his last pay certificates and submitted them with fake names, ranks and Force Numbers to the Nigeria Police pay offices in Lagos, Edo, Cross River, Kaduna, Kogi, Ogun and Akwa Ibom state Police Commands and allegedly collected the sum of N40 million from the purse of the Nigeria Police under false pretence. The police further alleged that the suspect perpetrated the fraud by transferring himself to all the aforementioned Police Commands with fake documents and promoted himself to the ranks of ASP, DSP and SP anytime he received information about promotions in the Nigeria police. Police investigation revealed that luck ran out on the suspect when he was arrested while wearing a fake SP rank. The Deputy Commisioner of Police in charge of FSARS Lagos, DCP Chris Ezike received an intelligence report about the activities of the suspect andy directed a police team led by DSP Solomon Igwe to fish out the suspect anywhere he may be found. Banor was arrested in Onitsha, Anambra State, southeast Nigeria, and brought to Lagos for interrogaton. After investigation, the suspect was arraigned before a Federal High Court in Lagos on a 30-count charge of obtaining about N40 million from the Nigeria Police under false pretence. The police prosecutor, Supol Charles Odii, told the court that Banor committed the alleged offence between 2006 and 2014 in seven Police Commands in Nigeria. Odii also told the court that the defendant who is a dismissed police officer forged the Nigeria Police documents and used them to collect about N40m from the Nigeria Police pay offices with fake names, Force Numbers and ranks in Lagos, Edo, Cross River, Kaduna, Ogun, Kogi and Akwa Ibom States. He said the ofences the defendant committed are punishable under the Money Laundering (Prohibition) Act, 2011, Advanced Fee Fraud and Fraud Related Offences Act, 2006 and the Miscellanous Offences Act, Laws of the Federation of Nigeria, 2004.